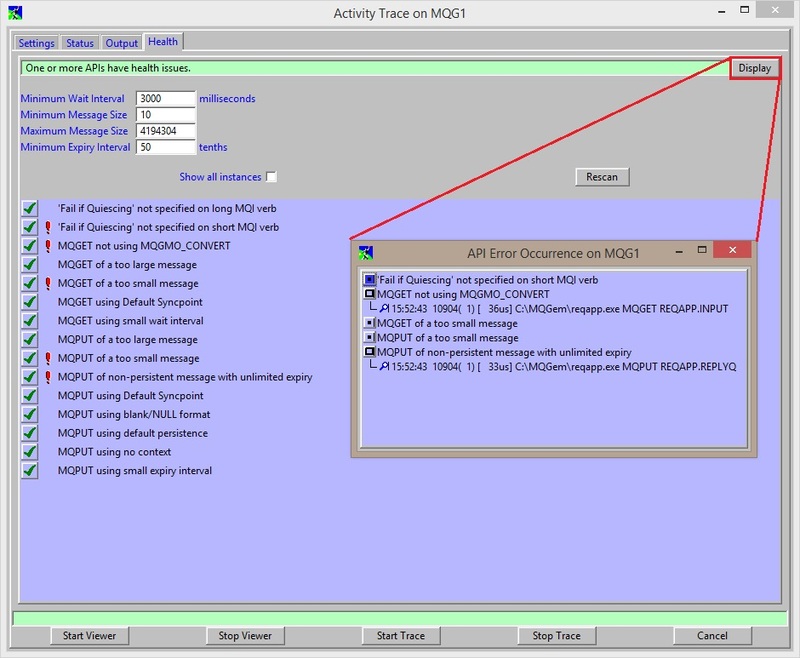 IBM MQ has a feature called Application Activity Trace, which allows you to trace what an application is doing, see the progression of MQ API calls, the objects utilised, the options used, the time taken for each call and so on. To get the most out of this feature, which writes its output as PCF messages, you need to be able to, not only read the content of those PCF messages, but display them in a way that allows you to drill down into the data, exclude data from your view to allow you to focus on what’s important, search for particular objects in use, or particular reason codes, and so on. 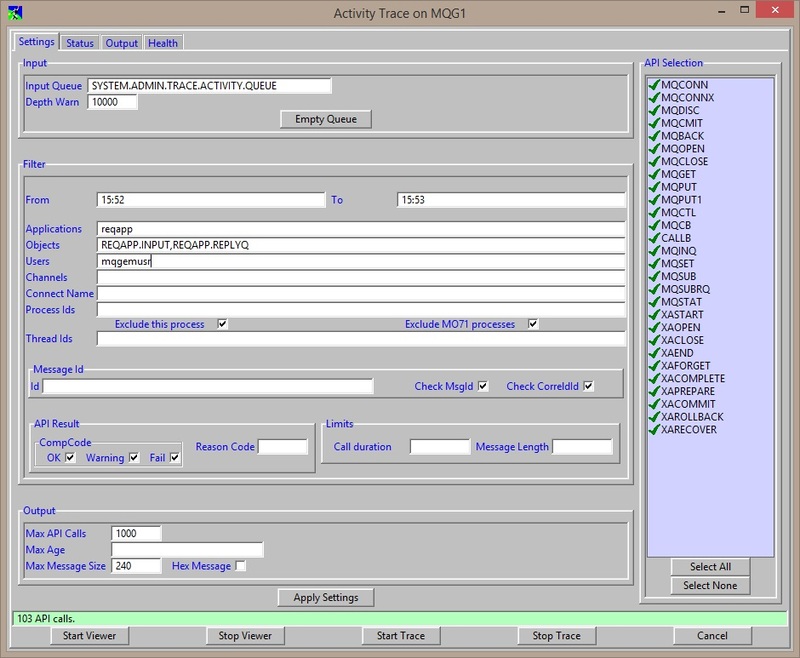 To this end, MO71 now has an Application Activity Trace viewer. At it’s simplest, it allows you to see the progression of MQ API calls, just like the IBM-supplied sample amqsact. However it can do so much more than that. Rather than having to decide to view every MQ API call in high detail, the viewer allows you to drill down into the verb you are interested in, without the confusion of seeing high detail of everything else at the same time. With a trace that spans many pages full, even when only showing one line per verb, you may wish to reduce the clutter on your screen further. You can filter the output in many different ways to see what you’re looking for. For example, you could choose to hide all the MQPUTs and MQGETs and focus on the other calls, like the MQOPENs. You can filter the output to focus on a particular object or objects that you are interested in, or a particular process id. In fact there are many different factors that you can used to filter down the data to make is easier to view. There are a number of behaviours that MO71 can check for in your application. These are listed on the Health tab, and if any issues are found you will see them highlighted with a red exclamation mark. You can display the instances in a separate window which then allows you to jump into the main output window at the point where the issue was detected. The current list of health issues is not final, and if you have any other issues you would like to see MO71 check for, please comment below or get in touch in the usual ways. The Application Activity Trace viewer in MO71 will help you make sense of, and get great insight from, your tracing of your applications. This entry was posted in MO71, MQGem tools and tagged GUI, IBM MQ, IBM WebSphere MQ, MO71_Jul2017, MQ, MQ API, MQ Appliance, tools, WebSphere MQ by mqgem. Bookmark the permalink.